Hakusan, Japan April 2, 2012 - Eizo Nanao Corporation (TSE: 6737) today announced the release of the RadiNET Pro network quality control (QC) management software Version 4.1.1 which is now accessible via mobile devices through an easy-to-operate interface. 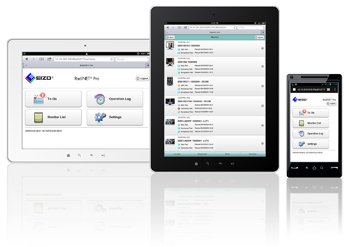 With the new version of the RadiNET Pro software, hospital monitor administrators or maintenance service managers can access the QC server within their hospital anytime, from any location where their web-enabled mobile device has Internet connectivity. This helps administration personnel to work remotely saving both the time and expense of on-site visits and improves the speed of the QC work flow. The mobile interface is compatible with Apple iPad, Apple iPhone, and Android-based devices and is designed to easily navigate and perform operations with the touch of a finger via a web browser. This results in no special software needing to be installed on the user's mobile device. This mobile accessibility has a remarkable affinity with RadiNET Pro Web Hosting, EIZO's network QC server hosting service for hospitals around the world, which improves the QC workflow convenience for monitor administrators. Today's release enhances the monitor QC solution offering from EIZO which enables healthcare professionals to improve productivity and efficiency of their medical practice. EIZO will demonstrate this mobile solution of RadiNET Pro at SIIM 2012 (the 2012 Annual Meeting of the Society for Imaging Informatics in Medicine) to be held from June 7th to 9th in Florida, USA at the Orlando World Center Marriott. EIZO will be located in booth #606. Release of RadiNET Pro Version 4.1.1 is scheduled for May of 2012. Availability varies by country so please contact the EIZO subsidiary or distributor in your country for details. EIZO and RadiNET are registered trademarks of Eizo Nanao Corporation. iPad and iPhone are trademarks of Apple Inc. Android is a trademark of Google Inc.